(Documents) "Esterville, Emmett Co - Aug 7/61", dateline on 3½ page letter from Emmett County Judge Adolphus Jenkins to Samuel J. Kirkwood, Governor of Iowa, some interesting Indian and Troop content "…As there is a strong effort being made in this county to raise a decidedly uncalled for excitement in regard to the Indians. 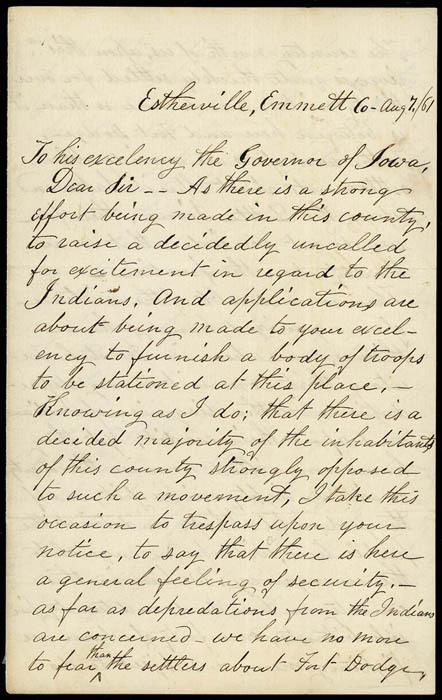 And applications are about being made to your excellency to furnish a body of troops to be stationed at this place…As far as depredations from the Indians are concerned - we have no more to fear than the settlers about Fort Dodge…There is no doubt of the existence of an organized band of horse thieves, somewhere in Dacotah Territory that commit many depredations in the disguise of indian and upon their credit…" and goes on to say that it would seem to be foolish to have troops taken away from the war effort to aid his county, Very Fine and interesting content. (Express) Baldwin's Southern La. Express M.R. 8154, blue cds ties 3¢ rose (65) on light buff cover to New Orleans La., docketed "Express Matter, McKeerer vs Baldwin, letter from Mr Baldwin"; minor perf toning, partial flap, Very Fine. U.S. mail route 8154 on the New Orleans, Opelousas & Great Western Railroad line between New Orleans (Algiers) and Brashear La. was under U.S. military control from July 1, 1862, until February 1, 1866. Its operation, with a steamboat connection between Berwicks Bay and Galveston, was essential to mail service. The U.S. mail contract with Baldwin as agent was awarded to the NOO&GW on May 26, 1866, at $100 per mile per year. This circular handstamp is found on covers carried on the NOO&GW line between January and May 1866. (Express) Commercial Express, Oct 25 1865, large double-circle datestamp ties 3¢ rose (65), nat. s.e. 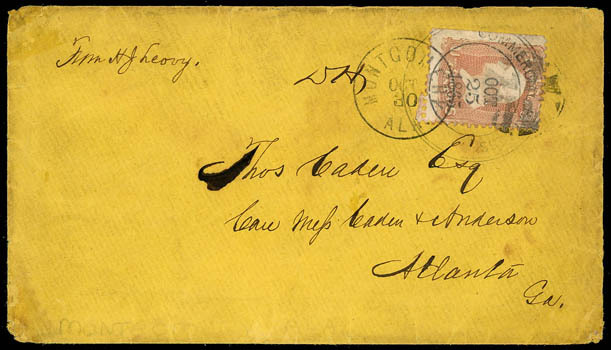 at left, on orange cover to Atlanta Ga., entered mails with "Montgomery Ala., Oct 30" duplex also tying stamps; small edge tears and wear, Fine and scarce post-war express use. ONE OF ONLY THREE RECORDED EXAMPLES OF THE LARGE DOUBLE-CIRCLE COMMERCIAL EXPRESS COMPANY DATESTAMP. The Commercial Express Company was a private express company with headquarters in New Orleans La. that operated from July 1864 until February 1866. Larry Ballantyne wrote the most comprehensive article on the company published in the Penny Post (October 2009) with a census of 13 covers with two large double-circle datestamps (this is not one of them). (Naval) U.S.S. 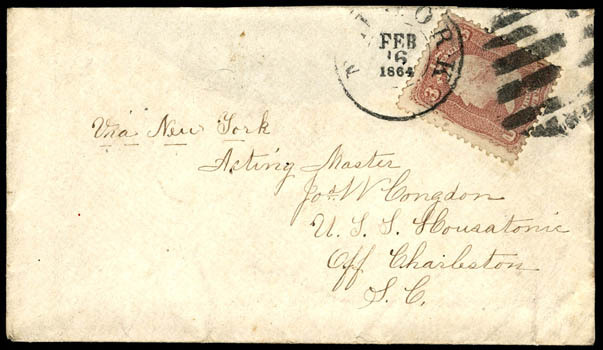 Housatonic, letter addressed "Acting Master, Jos. W. Congdon, U.S.S. 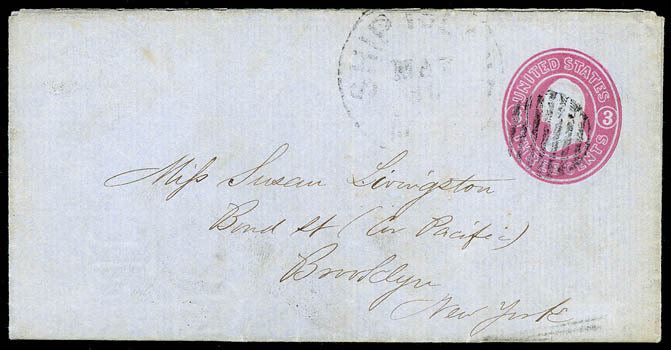 Housatonic, Off Charleston, S.C." and endorsed "Via New York", franked with 1861, 3¢ rose tied by "New York, Feb 16, 1864" cds and large grid; missing backflap, still Very Fine, a letter addressed to and posted the day before the sinking of the U.S.S. Housatonic, accompanied by biographies and the Congdon's testament at the Naval inquiry. On February 17, 1864, the Confederate submarine "Hunley" sank a blockader, the USS "Housatonic" off Charleston S.C., marking the first wartime sinking of a ship by a submarine. The addressee was one of 21 officers and 129 men rescued by the "Canandaigua" following the sinking of the "Housatonic". The February 16th use was posted one day before the USS Housatonic sunk. The Congdon correspondence is known however virtually all the covers are addressed from the Housatonic to Congdon's wife in Long Island. (Naval) "U.S.S. 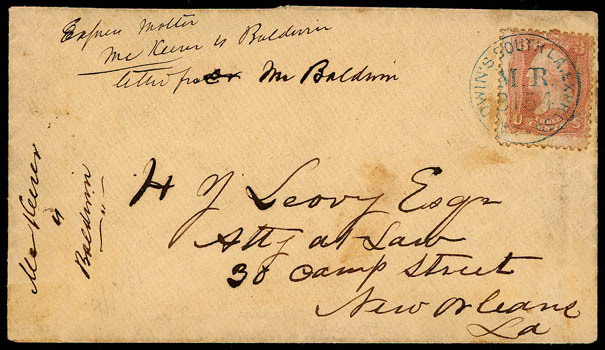 Richmond, New Orleans May 29th 1862", dateline on 3¢ pink (U36) blue lettersheet cancelled by grid cancel duplexed with light "Ship Island, May 30" cds to Brooklyn N.Y., reads in part "…As the McClelland leaves this port tomorrow with a mail for the North I take great please in penning a hasty line…almost wish myself out of this muddy river on the "rolling billows". If we are to attack Mobile as ordered we soon will be on the blue water again and will see some more of this horrible bloodshed…My last was written above Natchez. We went thin 3 miles of Vicksburg when the large ship was ordered down without attacking the place on account of the falling of the river. We arrived here yesterday after our trip up the river so resembling a pleasure excursion…I have heard our Captain say that he expected to spend the 4th of July in New York, Mobile is not yet taken though…", Very Fine letter with excellent Naval content. The USS Richmond was a wooden steam sloop in the United States Navy during the American Civil War. She served on the Mississippi River blockade. During this sailing, the Richmond departed New York on February 13th 1862 and joined the West Gulf Blockading Squadron off Ship Island on March 5th as Flag Officer David Farragut prepared to seize New Orleans. Richmond crossed the bar on 24 March with the fleet and began making preparations for battle. On 24 April Farragut's fleet ran past the forts, engaged and defeated the Confederate flotilla, and continued upriver for about 12 miles. Though Richmond was hit 17 times above the waterline, her chain armor kept out many rounds and limited her casualties to two killed and three wounded. Richmond landed her Marine detachment at New Orleans to help keep order until General Benjamin Franklin Butler's Army troops arrived. Richmond helped take possession of military installations at Baton Rouge, Louisiana on 10 May 1862. Four days later she cruised upriver, first to a point 12 miles below the juncture of the Red River, thence off Natchez River and finally to a position below the Confederate stronghold at Vicksburg on 18 June 1862. (Post-War) Military District of Georgia, Office of Chief Commissary, official imprint on legal-size cover endorsed "Confederate State Papers Connected with Gold Receipts for gold in hand, Judge Black Washington DC" with original letter datelined "Washington May 20th 1865" and reading "Rec'd of Maj R.J. Moses chf. C.S. 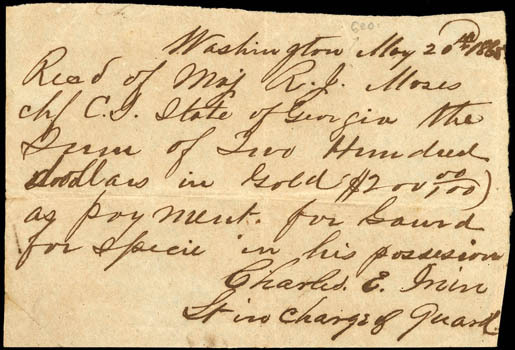 State of Georgia the Sum of Two Hundred dollars in Gold $200 as payment for Guard for specie in his possession, Charles E. Inin, Lt in charge of Guard"; cover aged, Fine and interesting post-war item. 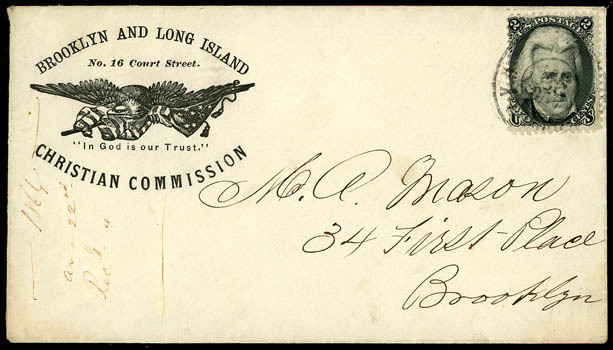 (Sanitary Fair) Brooklyn and Long Island, Christian Commission, illustrated Eagle and Flag patriotic corner card on cover bearing 2¢ black (73) tied by "Brooklyn N.Y., Aug 22" cds; 1864 docketing at left, Very Fine. 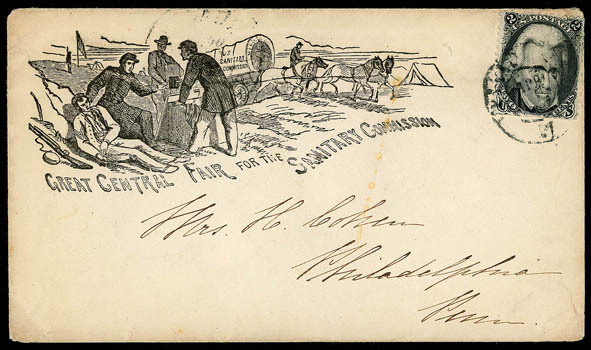 (Sanitary Fair) Great Central Fair For the Sanitary Fair Commission, black illustrated imprint showing battlefield scene on local drop rate cover bearing 2¢ black (73), bottom s.e., tied by "Philada. Pa., Apr 1" cds, Very Fine and scarce. 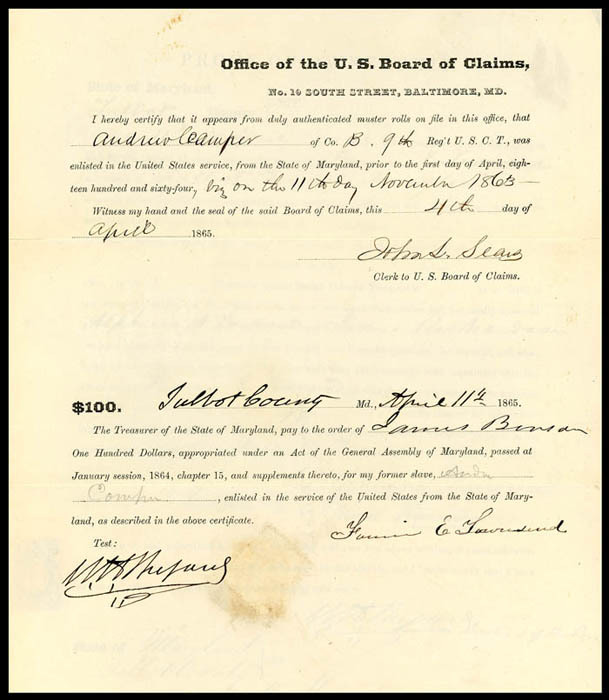 (Slavery) 1865 U.S. Board of Claims Document for Slave, certified claim form for Andrew Camper of Co. B 9th Regt. U.S.C.T. (U.S. Colored Troops) was enlisted in service for the State of Maryland on Nov. 11th 1863 and that his prior owner was entitled to $100 as compensation for his war service, attached is certified Proof of Ownership by Fannie Townsend with 5¢ Revenue stamp affixed and cancelled April 1, 1865, Very Fine.